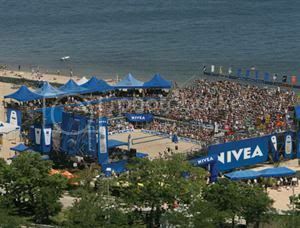 Nivea and the AVP today announced Nivea as the pro beach volleyball tour's new title sponsor, replacing Crocs. The multi-year partnership makes Nivea the exclusive skin and personal care product of the AVP. The partnership includes promotional and marketing rights to all of the AVP tour and "advances Nivea's mission to bring people closer together by tying the brand closely to impactful moments of human connections." Planned marketing initiatives surrounding the newly titled 2010 AVP Nivea Tour will support multiple product lines including new Happy Sensation Body Lotion and Touch of Happiness Body Wash. Activities will include, advertising, on-site signage, sampling activations, retail activities, PR, contests and online. "With its newly launched Touch of Happiness Body Wash and Happy Sensation Body Lotion, Nivea is bringing happiness to consumers' everyday life. Through our partnership with the AVP, Nivea will have a unique opportunity to spread happiness to the US, from coast to coast and across the country where beach volleyball fans will gather to enjoy happy days of sand, outdoor, fun and play," said Nicolas Maurer, Vice President, Marketing, Beiersdorf Inc.
"This is a great day for the Sport of Beach Volleyball and a watershed day for the AVP," said Jason Hodell, AVP CEO. "For a brand with the scale and resources of NIVEA to support the growth of Beach Volleyball is very exciting." In a massive rebranding reflecting Nivea's title sponsorship, all AVP NIVEA Tour events and creative will go from yellow to blue, transforming tournament sites into a "sea of blue." The addition of the AVP sponsorship adds a summer complement to Nivea's impactful New Year's Eve and Valentine's Day campaigns around kissing. "Signing Nivea ushers in a new era of growth and stability for the AVP," said Mike Dodd, AVP commissioner. "With its iconic character, its dedication to skin and body care worldwide, Nivea fits perfectly with the health and vitality of our players. I see no limits to our future together." The AVP Nivea Tour opens the 2010 season April 16-18 in Fort Lauderdale, Fla.